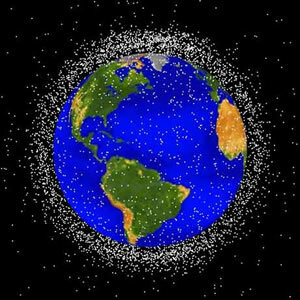 Australian scientists are working to reduce orbital debris that clogs the handy orbits above Earth. According to Matthew Colless, director of Australian National University’s Research School of Astronomy and Astrophysics, the project will likely be a reality within the next ten years. Australia now has a contract with NASA, the US space agency, to track and map space junk with a telescope equipped with an infra-red laser at Mount Stromlo Observatory. But $20m from the Australian government and $40m in private investment will help the team set up as the Cooperative Research Centre (CRC) to develop better lasers to track tiny pieces of debris, importing techniques from astronomy used to remove the blurring of the atmosphere. The ultimate aim is to increase the power of the lasers to illuminate and zap pieces of junk so they burn up harmlessly as they fall through the upper atmosphere. Over the years, various sf books and movies have made an effort to provide ideas to solve this problem. In his 1978 novel The Fountains of Paradise, Arthur C. Clarke uses Operation Cleanup to make sure that low earth orbit is clear of debris for the newly constructed space elevator. Fortunately, the old orbital forts were superbly equipped for this task. Their radars - designed to locate oncoming missles at extreme ranges with no advance warning - could easily pinpoint the debris of the early Space Age. Then their lasers vaporized the smaller satellites, while the larger ones were nudged into higher and harmless orbits.